On March 23, 2012 my baby girl, Siona Telang Nanda, was born! She was two weeks early and she came into this world with a bang! I had an unplanned delivery at my home….all by myself….well, not all alone Siona was there too : ) I’ll just leave it at that other than all turned out great and 6 months later all is even better. Well, all is better except her bedroom! Siona just recently moved into her room from our bedroom (literally this week!). Like many new parents the nursery is still a work in progress! The up side to this is that I can now share with all of you some of the design process of creating her room. From my inspirations, to Siona’s design story (from her mother’s perspective while I still can!) furniture selections, color, fabric, challenges, tips etc…..
For me, when I begin the design process of a space there’s usually an inspiration piece that sets the stage for the design story and thus sets the tone for the room. Inspiration for a space can come from practically anything. I love when it’s something one already owns. Maybe a family heirloom, something picked up from travels etc…..
My inspiration for Siona’s room is not nearly as sentimental or romantic as this though. The inspiration for her room came from a brief shopping trip at Anthropologie this past winter. 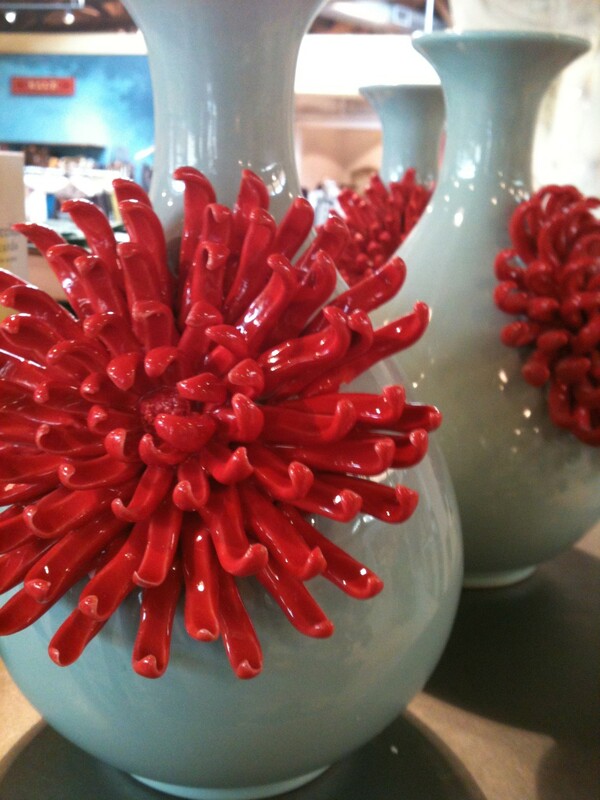 I came across this vase (picture above taken with my iphone in the store the day it was discovered!) and right away I knew this was the color scheme I wanted. The light blue/green/gray and the tangerine combination was the perfect balance of sophistication, modern,yet whimsical. The chrysanthemum and the shape of the vase were classic, yet bold which of course is how I pictured my daughter…bold, yet classic. (Ah!….a mother’s dream.) With this color combo and bold yet classic appeal I knew Siona’s room was going to be atypical nursery to say the least and that excited me even more! Stayed tuned for more on Siona’s space! Coming next….Siona’s design story and the foundation of the room….the rug! Love it! How could she not be bold and classic with you as her mommy!! Tell us more! I can’t wait to read and see more! I was so glad to hear from you this morning that she seems to love her room already! A good, sound night’s sleep last night , and a cheery gaze around the room first thing this morning. Sounds like a wonderful beginning.